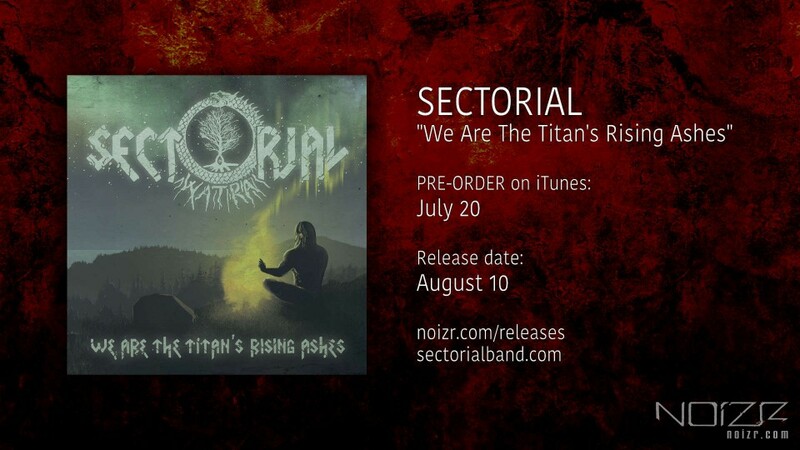 Sectorial: pre-order for album "We Are The Titan's Rising Ashes"
Sectorial's new album "We Are The Titan's Rising Ashes", which comes out on August 10 via Noizr Productions, is already available for pre-order from iTunes for $4.99 (on release day it'll cost $8.99) with two instant tracks "Tree Eater" and "Autumn Silence Is Covered With Ice". Later, "We Are The Titan's Rising Ashes" will be released on CD Digipack. The band comments in the interview with Noizr Zine: "In the theme of this work, we continued the line of man's relationship with the outer world, with nature in particular. It's by nature in all its beauty and diversity we gain inspiration. For us, the constituent part of this is to use in our creative work various ethnic instruments such as the very old (bukkehorn, harp) and more modern (tin whistle, flute chromatic, etc.)." "W.A.T.R.A." ("We Are The Titan's Rising Ashes") is the second full-length album of the Ukrainian metal band Sectorial. It consists of 10 tracks, filled with the power of blast beats and guitar riffs' aggression, softened by melody of folk instruments. The album's heavy metal sound is supplemented with Ukrainian flavor, achieved by using drymba and flute, and Ukrainian-language lyrics. Listening to the album you can hear the sound of the many folk instruments, apart from the afore-mentioned drymba and flute, musicians also used an overtone flute, bukkegorn, Bulgarian kaval, tin whistle, rainstick, shakers and tambourine. "We Are The Titans Rising Ashes" was recorded at Kiev Morton Studio from July to September 2014. Mastered and mixed by Max Morton. Cover artwork created by Yuri Nagorniy.